Air Travel with the munchkins: Luckily, I have little to report on the 11+ hours of airplane travel. Lufthansa was great and having seat-back TV screens was AWESOME! The kids zoned out and crashed hard. DD#2 slept for at least six hours straight. I spent most the time watching my family sleep. I don’t sleep well on planes. The food was average and the vino pretty good! 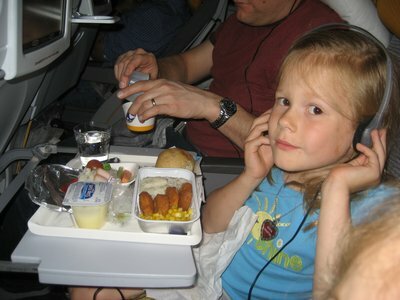 The kids were especially impressed with the toilets that were located downstairs in the plane. Overall, this was one of the best long flights I’ve been on. 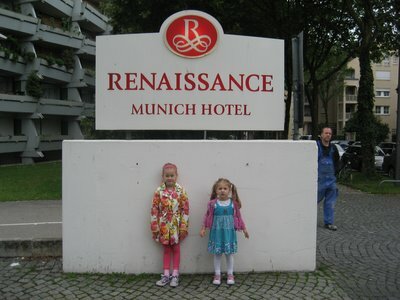 First evening – We arrived in Munich late. We used the Lufthansa Airportbus to take us to our hotel. It was well worth the 20 Euros. People sure drive fast around here! The hotel room is great – especially considering it was a steal using Priceline. We have a nice balcony that faces some trees filled with singing birds. 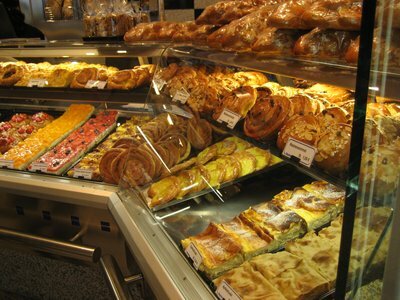 There is a grocery store and a bakery located in the hotel. That has been very convenient. Although we were tired, it was around 7pm when we finally checked in, we were eager to walk to a biergarten! 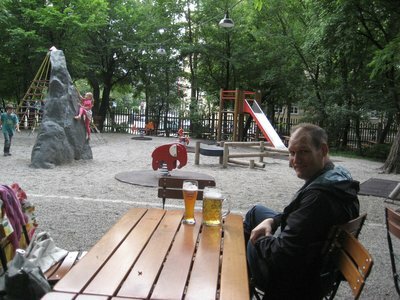 We bought a 3 day subway pass (around 20 Euro) and traveled a couple stops to a nearby biergarten. Sadly, after a 15+ minute walk with tired kids, we struck out. Things close early here on Sundays. Luckily, we walked past an Italian-ish joint and had a pretty good first meal. 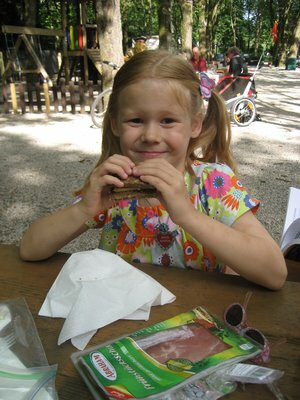 Monday June 20 – We started the day at the little bakery. I think we were their first customers. We all woke up around 5am. Gotta love jet lag! We are all BIG fans of the German baked goods around here. Yum! 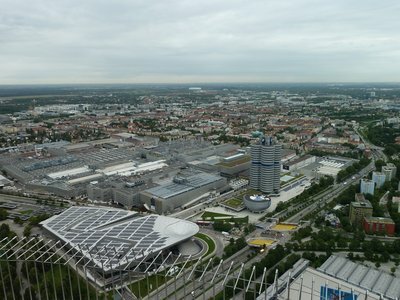 Next we took the subway to the BMW Welt and watched DH drool over the cars and amazing architecture. It was only 8:30am at this point and nothing was open. 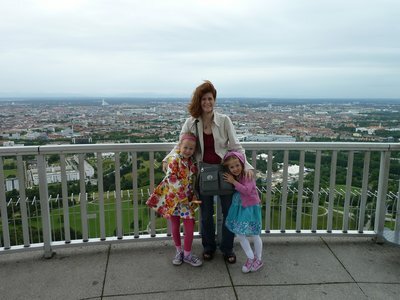 We meandered to the nearby Olympic grounds and were the first ones to the top of the Olympiaturm. 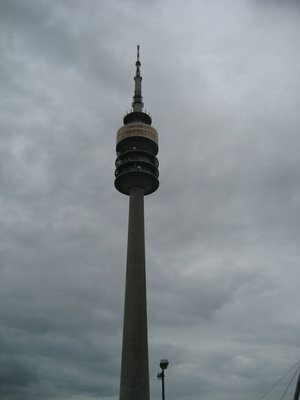 It’s the tallest structure in Munich. It was kind of chilly outside and drizzling off and on. 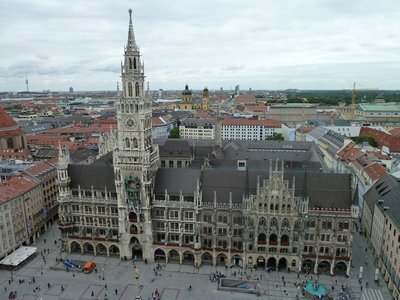 After this, we took the subway downtown to the Marienplatz. 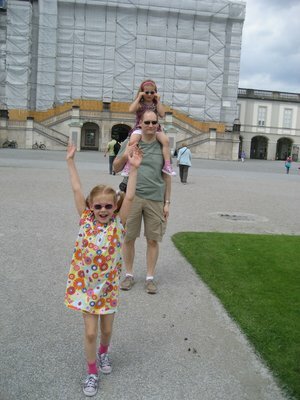 I wanted the girls to finally see what old (or rebuilt in this case) European architecture looks like. 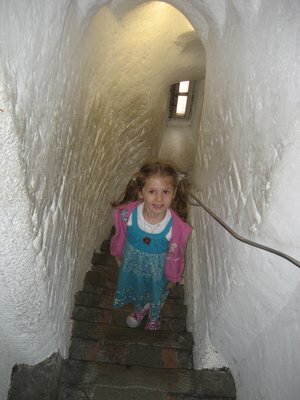 We wandered and climbed to the top of St. Peter’s church. I think we all liked the views here better than the Olympiaturm. 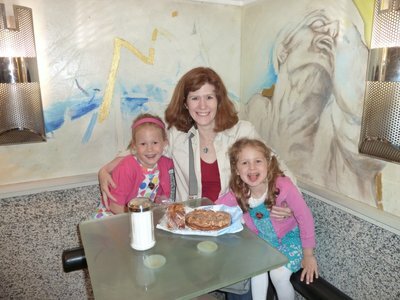 I think I forgot to mention another stop at a German bakery. We couldn’t help ourselves! Hey, we’d been up since 5am! After more wandering through the markets and busy streets, we found a recommended restaurant for lunch – Andescher am dom. They served the famous Andechs beer that DH and I enjoyed on our last trip. We finally had some fantastic wurst for lunch. After a quick peek in another church, we took two melting down kids back to the hotel for naps. 4+ hours later….. (yes, we all accidentally fell asleep) we realized all attractions were probably closed. 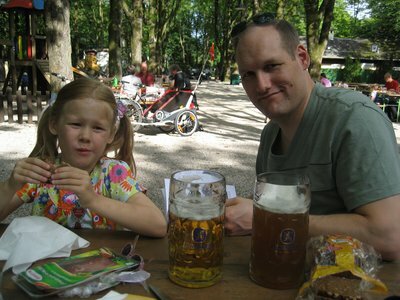 Since we had energy, we decided to hit a couple of biergartens for dinner. Did I mention that it was still cold and drizzly? First stop was the Augustiner biergarten. Where was everyone? The garden was nearly empty. 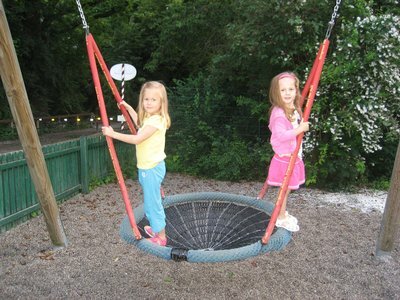 We sat by the playground and let the kids play for a while. None of the self-service food stands were open like we had hoped. Luckily, the Augustiner had a neat downstairs cellar restaurant with a live oompah band. 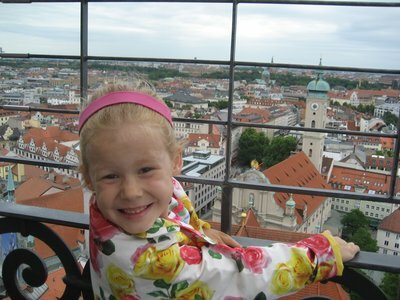 We enjoyed a Bavarian cheese plate down there and relaxed for a while. Does this sound like enough for one day? Of course not! 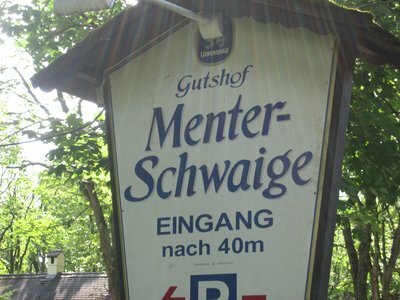 We continued on a tram to the largest biergarten in the world – the Hirschgarten! It was in a lovely park that was MUCH more walking than anticipated. Our poor kids! They mostly kept it together although we buckled and carried the 4 year old too much. Sore back and shoulders! The Hirschgarten was also pretty empty and we had to eat at the restaurant part. This was getting expensive. A new strategy was in the works for tomorrow…. Anyway, we enjoyed spetzle and pork with more beer. I cringe a bit when going over just how much we ate today. However, it seemed like two days. Does that count? The kids kept calling the morning’s activities yesterday. The walk back to the subway from Hirschgarten was longer than expected. Luckily, there were adorable bunnies hopping all over the place which kept the kids entertained. 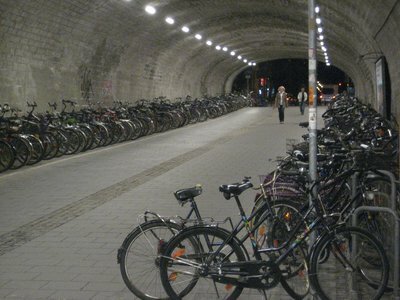 We were fascinated by the number of bikes outside of the subway stop. It’s Munich-style park and ride! Tuesday June 21 – Ahhhh – relaxed and up a whole hour later than yesterday. 6am. I was ready to run off some of that wurst and cheese. 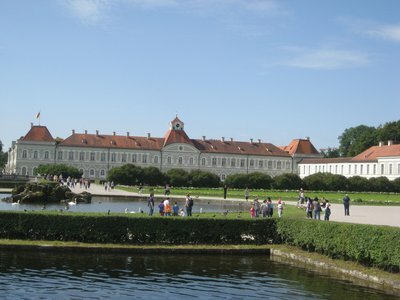 I went for a long run through the Englischer Garden. It reminded me a lot of Central Park in New York. I had considered coming back to the Garden later in the day but realized just how much walking is involved. I love walking but after yesterday I vowed to be more considerate to 4 and 6 year old legs. Again, the girls were wearing down – especially DD#2. DH and I decided to divide and conquer. He took DD#1 back to the BMW Welt and Museum while I took DD#2 to the hotel for a needed nap. Random things I’m noticing: there don’t seem to be drinking fountains ANYWHERE! Water really does cost 4+ Euros in a restaurant. We’re carrying water bottles from now on. 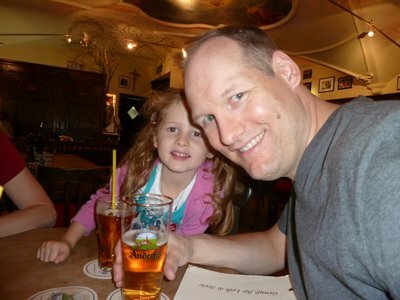 Beer is around 75cents in the grocery store vs. 3,50 Euros in a biergarten. Hmmmm … I’m starting to do the math here. Math is never good on vacation. I know this is super detailed. I probably won't be able to keep this up! 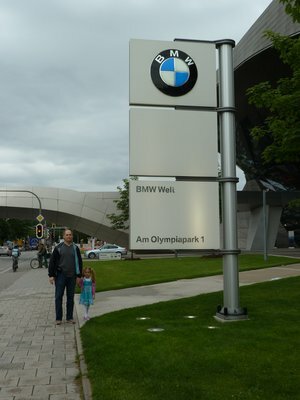 Stay tuned for the next post about our experience at the BMW Welt picking up the car. Unbelievable service! I'll wait until I have photos to do it justice! That's all for now!